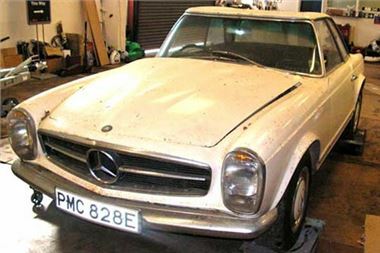 A ‘barn-find’ Mercedes was star of the show at Barons’ March 15th auction making well above its £7,500-£10,000 estimate. The 1967 250SL was offered for auction in need of total restoration, although its long period of barn storage had been kind to it and it remained very sound throughout. Coming to auction from a deceased’s estate, the car was non-running and the keys had long-since been lost. Despite this, the generally sound condition and long period of single ownership fired the interest of collectors and with spirited bidding from buyers in the room and on the telephones the car was sold for a resounding £12,430. Other cars needing remedial work also created a lot of interest. A 1969 Jaguar E-Type fixed head coupe created a bit of a stir despite needing a total bare metal respray. Although the panels were very sound, a careless paintjob in the past had left this pale blue 4.2 with a peeling and cracked finish over its entire surface, but despite this, the car had an exceptional history with just three owners from new and comprehensive paperwork dating back to 1976. Proving that first appearances can be deceptive, prospective buyers voted with their hands and an appropriately strong £15,400 was achieved. Turn-out for March sales is traditionally low and this sale was no exception. However notable prices were achieved throughout the sale including £8,360 for a sound but slightly scruffy 1971 Jensen Interceptor II and a firm £7,480 for a superbly presented 1970 Ford Capri 3.0. Surprising several seasoned auction-goers, some of whom failed to appreciate its ‘emerging classic’ status, a one-off 1988 Vauxhall Astra Quicksilver with limited edition paint and trim and just 57 miles from new made a very strong £4,730, while a nicely-executed 1986 Porsche 924GT recreation made a well-deserved £4,510. Barons is now taking entries for its annual Jaguar Heritage sale – traditionally a popular event and a ‘must’ for lovers of the ‘big cats’. Early entries an immaculate, concours-condition 1948 3.5-litre drophead coupé (estimate £95,000-£125,000), a stunning1960 MKIX 6.0 Saloon which has been rebuilt at a cost of over £85,000 (£50,000 – £60,000), a 1963 MKX (£8,000-£10,000), a 1958 MKIX auto (£12,000 – £14,000) ad a 1969 Series Two E-type FHC which has not been on the open market for over 21 years (£23,000-27,000). For further information or to consign a car to the sale, please visit www.barons-auctions.com, email info@barons-auctions.com or call 08454 30 60 60. For further press information or images, please contact Karen Coe on 01728 669185 or email kc@karencoe.co.uk.